This article shows you the way to bring Mi Redmi Note 6 Pro into Test Point Or EDL which is formerly known as Emergency Download (EDL) mode. Despite it is an advanced method, some users still prefer to use this technique to by-pass the need of officially unlocked bootloader. There might be a situation when your device got bricked or in bootloop state, but the bootloader has not been unlocked yet. Hence, this situation will force you to deliberately use the Test Point method. It would be impossible to unlock the boot loader since the device is bricked or is bootlooped. If you are newbie user then probably EDL mode may be a new word for you. But if you are involved in rooting and flashing firmware then absolutely not. In short, EDL mode is also known as emergency mode for mobile. Technically all the Xiaomi devices come with EDL mode option. If you want to install or update your own Xiaomi or Redmi phone then you have many options to flash new stock ROM on the device using Recovery Mode or using fastboot mode. Both methods have some limitations like Recovery ROM can be used only to update higher version and you can’t downgrade Mi Redmi Note 6 Pro version. Same as if the bootloader of the device is already unlocked then you may boot the device into fastboot mode and then can install stock rom using Mi flash tool easily. Both methods can be perform if the device is ON condition and you are able to access your device setting. But what if the bootloader of Mi Redmi Note 6 Pro is locked or Device stuck on MI account verification screen or device stuck on Mi logo or bootloop or you are unable to boot the device into fastboot mode? In that type of critical situation, EDL mode is the only solution which can help you to unbrick the device again. Just boot the device into EDL mode or emergency downloading mode and flash MIUI fastboot rom /firmware using Mi flash tool. It will fix all existing errors or you can recovery your dead phone again. It’s really must to understand that EDL mode flashing is an universal method for all Xiaomi and redmi devices. But EDL booting process may be different for different devices. For some devices, you can use EDL boot command but problem is that now a days edl command don’t work for all latest Xiaomi smartphones. So test point is the easiest and perfect method to boot any Xiaomi phone into edl mode using test terminals. 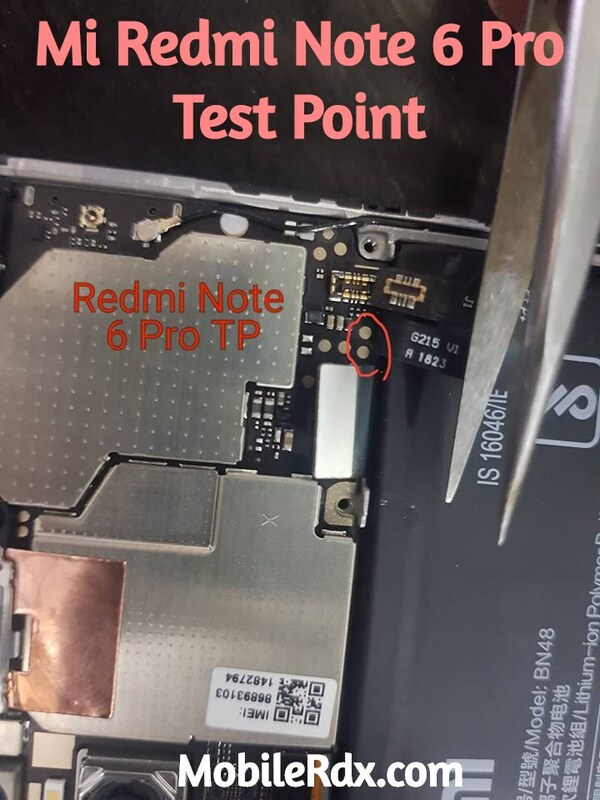 So now the point is that where is the Mi Redmi Note 6 Pro EDL mode PINOUT or EDL test points? Now remove the black tape to visible the edl points of Mi Redmi Note 6 Pro. IMPORTANT: Most of the other Xiaomi phone’s edl mode points are visible but in Mi Redmi Note 6 Pro it comes in hidden mode. Reasons are not disclosed by Xiaomi. But you can visible these test points by removing black tape. After removing the black tape you can see two test points easily. Now EDL mode or Mi Redmi Note 6 Pro edl test points are in front of you. And you can use them to install firmware on Mi Redmi Note 6 Pro without unlock bootloader.